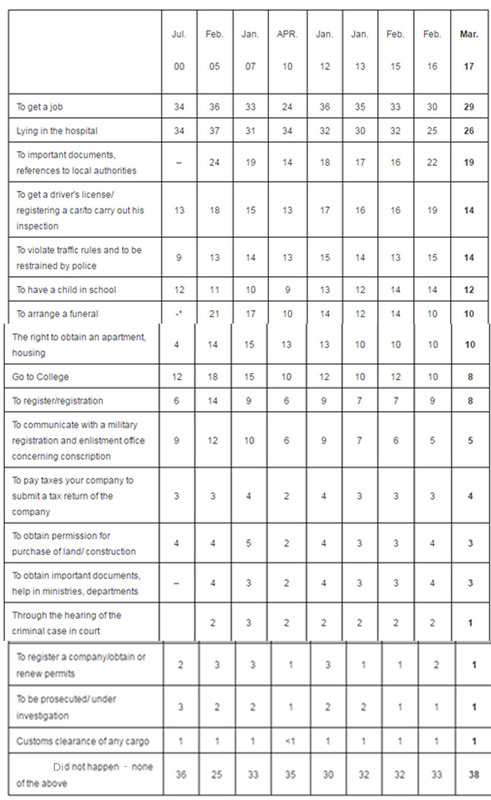 Russians now say they are experiencing modest improvement in the everyday corruption they must deal with, compared with three years ago, in finding jobs; getting medical treatment; applying for driver’s licences, car registrations and other local permits; dealing with police; paying taxes and customs duties; finding school places for children and cemetery graves for loved ones. WHAT CORRUPTION HAVE YOU, YOUR CLOSE FRIENDS OR FAMILY EXPERIENCED IN THE PAST THREE YEARS? Source: Levada Centre, http://www.levada.ru/2017/03/28/institutsionalnaya-korruptsiya-i-lichnyj-opyt/ -- released March 28, 2017. Opposition figure Alexei Navalny (lead image) has been fading from public awareness; recognition of his name peaked at 54% of Russians polled in October 2013. This month he was down to 47%, so he needed last Sunday’s demonstration and media coverage of his arrest to recover what he had lost. Publicity doesn’t mean political gain, however. 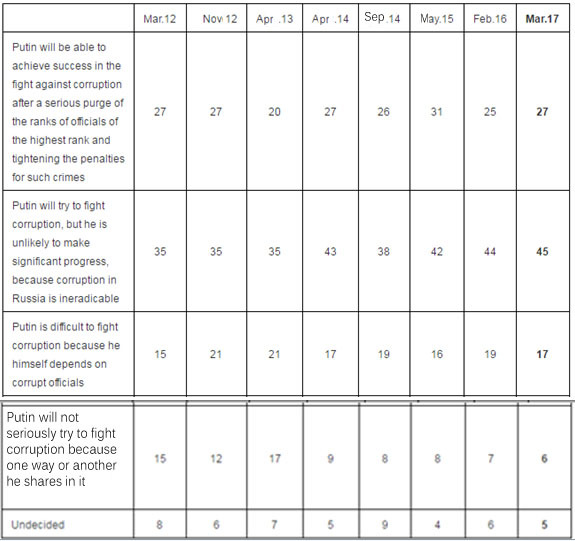 The proportion of Russians who have made up their minds that Navalny doesn’t deserve their support is visibly growing. WHICH WORDS WOULD YOU USE TO DESCRIBE YOUR ATTITUDE TOWARDS ALEKSEI NAVALNY? 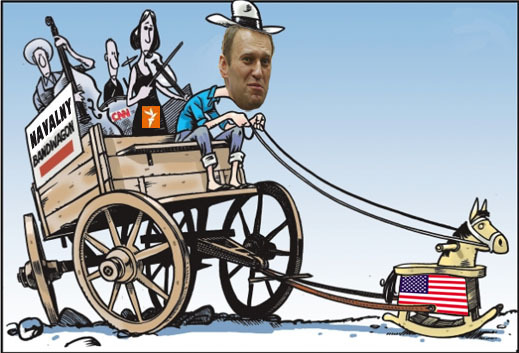 Source: http://www.levada.ru/en/2017/03/20/aleksey-navalny/ -- published on March 20, 2017. COULD YOU VOTE FOR ALEKSEI NAVALNY IN THE PRESIDENTIAL ELECTIONS? Source: http://www.levada.ru/en/2017/03/20/aleksey-navalny/ — published on March 20, 2017.